I've decided to ditch the stand-alone design and instead make it just an extension for Inkscape. It will be installed as a separate .deb package created using quickly that just hooks into inkscape. Now a quick run through the new plan. 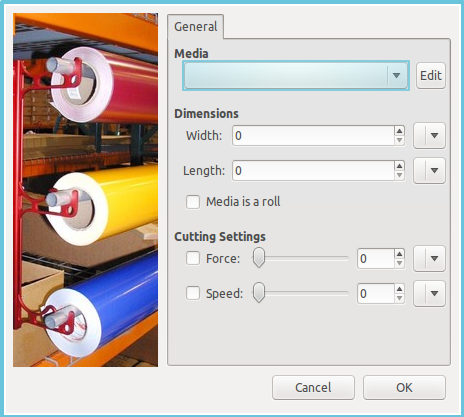 Selecting a material will layout set the width and height to the material to be used. Then you can make a plot based of of the canvas and just plot what is there. The plot will be positioned exactly how it is displayed on the canvas. "Device Setup..." will be a dialog that has all of the device settings (connection, rotation, calibration, blade offset, etc...). It will launch in a separate process and not hold Inkscape up. The device settings will be stored in an devices.xml configuration file. Settings will be saved per device so multiple plotters can be used with the same program without having to change properties. 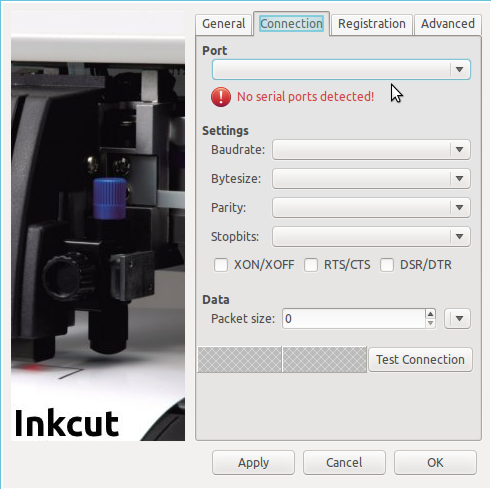 If a serial connection is used all the settings can be configured. Note: A device that connects via printer setup just uses the device name . Contour cutting will be added eventually... Size calibration for the device will be set here. 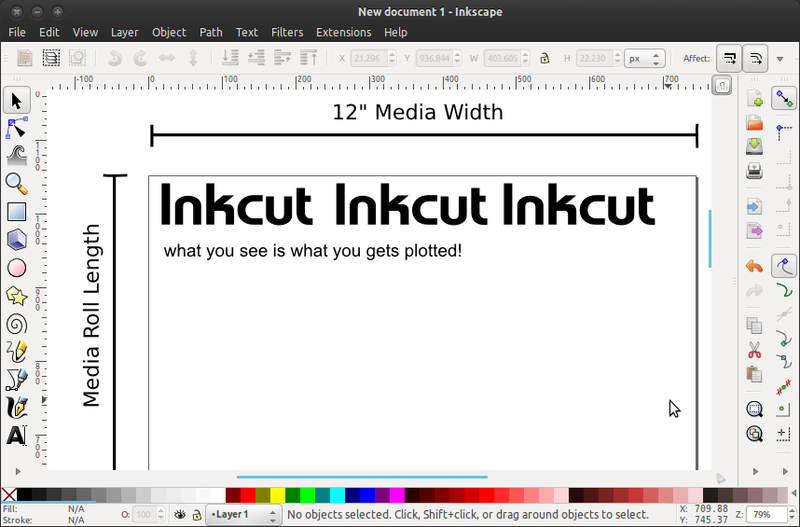 "Create Plot..." will be a dialog much like the previous versions of Inkcut. This will have options for creating multiple copies of a design, adding weedlines, adjusting spacing, etc... 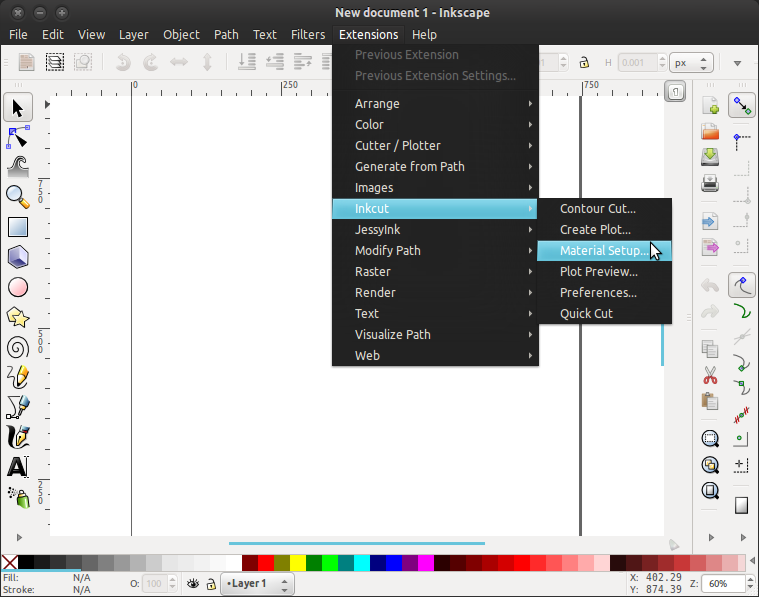 The preview will update in real time (in the dialog's preview window) and upon closing it will either update the Inkscape canvas with the created plot, launch a new inkscape window with the created plot, or close and spawn a send plot dialog. It will be assigned a shortcut key for quick access. "Plot Preview" will simulate plotting the file and add a new layer to the drawing containing an SVG representation of the HPGL data generated by Inkcut (like the preview of previous versions of Inkcut). 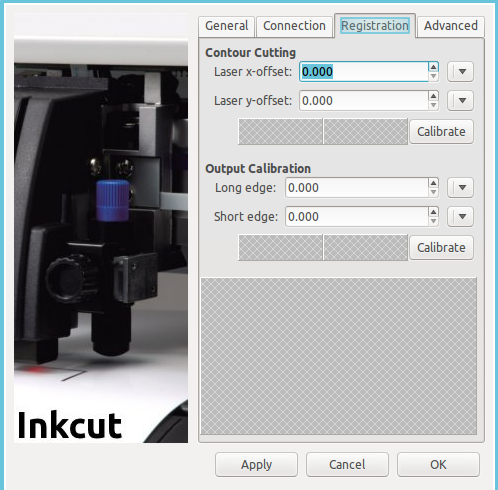 "Quick Cut" will send the current plot to the device without a preview. It will be assigned a shortcut key for quick access. Most of the coding still needs to be done due to changes to the UI and the recent switch from Gtk2 to Gtk3. With the exception of the blade offset algorithm, the core api for creating plots is finished and all that needs done is the UI code has to be written. I got your plugin running on Inkscape v0.48.2 on Windows (XP) and succesfully plottet on my Roland CAMM1 with it! I had to install GTK+ and I used "winscan32.py" instead of "scan.py" for Linux. 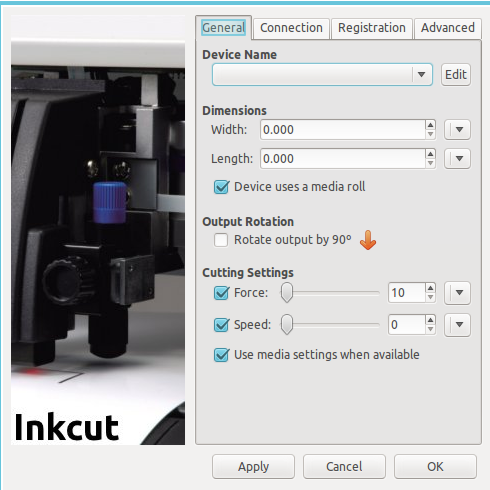 may you please explain it more detailed, how you got inkcut1 runnig under winxp? i´m not that good on computers..
i have the same Problem like Tom and I don`t understand how I can fix this problem. So it's now June 2013 and I was wondering when this update is due to be released? Yes, exporting to a DXF, importing that to a vintage program on an outdated computer is a pain.Ontop the only win printer driver that wxist contain the same foult as the only standalone ; suddenly the pen go down and cut transverse from corner to corner, it's as if plotters are forgotten, even how difficult can it be with just a handfull of instructions --- in short there will be thousands who would be happy if they could use their cheap xy cutter plotters under Windows. And yes, no doubt there are better systems than Windows but I just want to cut my designs and find it silli to become also a specialist in yet another system. I mean I allready are a pro. AutoCAD, A Lisp fanatic --- now just to use my plotter I must become a Linux neard ; I say NO, Linux proberly are nice but I just want to cut my designs why must I spend years to be able to do that ??? ?